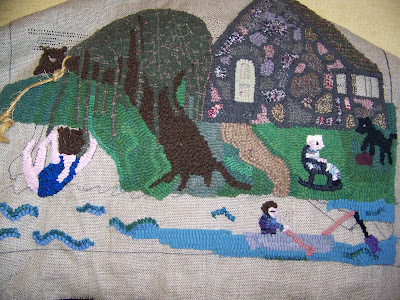 I've made some progress on the cottage rug. I hooked the lawn, mostly with the strips that had already been cut - they dyed up nicely. I did some more bleeding and marrying and came up with overly textured wools - I used some pendleton plaids and some dark gray tweeds - so, I decided, rather than get out the Cushing dyes, I'd just hook the water with the solid blue I already had. I also have a really nice blue and green check, so I used that for waves and decided that's my textured wool for the water. I really started to have fun with this rug. I saw an old photo in an album I'm putting together for my mother, and my mother and grandmother were sitting in front of the cottage talking - so, I hooked my grandmother into the lawn. Then, I kept thinking about my brother going fishing - well, both of my grandfathers did a lot of fishing there, too, so I hooked in a boat and a fisherman. The boats at the lake were both painted white, but I decided to work with the wool that was already in a box at my feet and the lightest there was a gray. I finally had a good feeling about this rug, the same feeling I used to get as a kid when I had a piece of paper and a box of crayons, drawing without a plan, just adding parts as I thought of them. Hooking without a pattern is like that, and I think I'll do it more often.